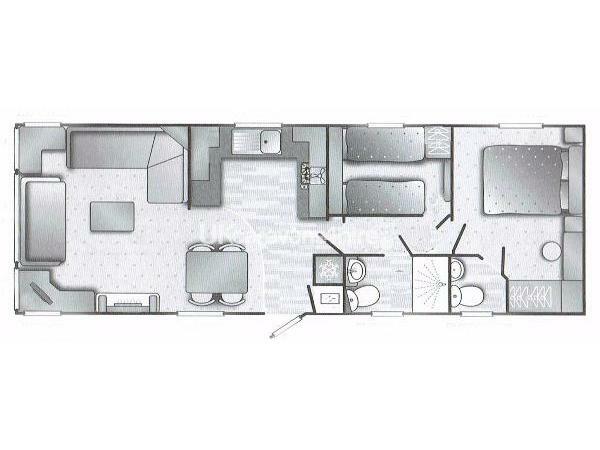 Additional Info: Master Bedroom with Double size bed and en-suite toilet and washbasin. 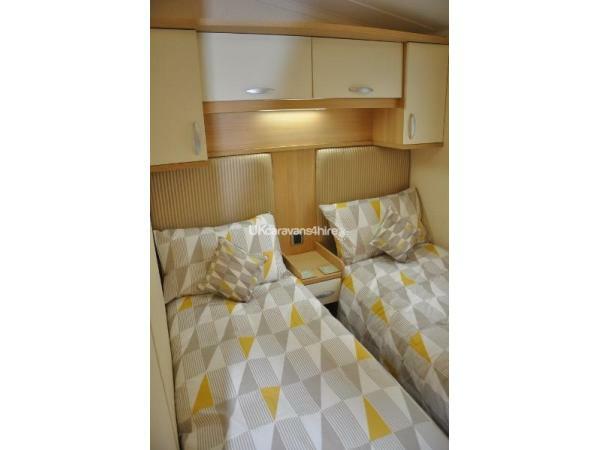 Twin Bedroom with twin beds. Shower Room and toilet with hand wash basin. All Bed Linen and Towels supplied and included in rental fee (except pool/beach towel), also included toilet rolls, liquid soap, kitchen roll & washing up liquid. Other equipment supplied: Hair-dryer, Rotary Dryer and Indoor Airer. 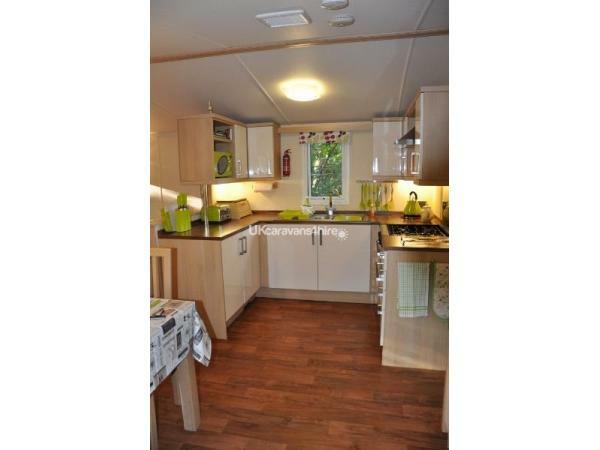 Fully equipped Kitchen with Microwave Oven, Cooker, Fridge Freezer, utensils and crockery for 4 people. Decked outdoor area Picnic Table with bench seats, BBQ, Car Parking, Fenced Perimeter, Smoking is Not Permitted. Dogs welcome (£5 per dog per day, minimum charge £20 per dog to cover additional cleaning) (max 2 dogs). £50 non-refundable deposit required on booking with balance due 6 weeks prior to arrival. 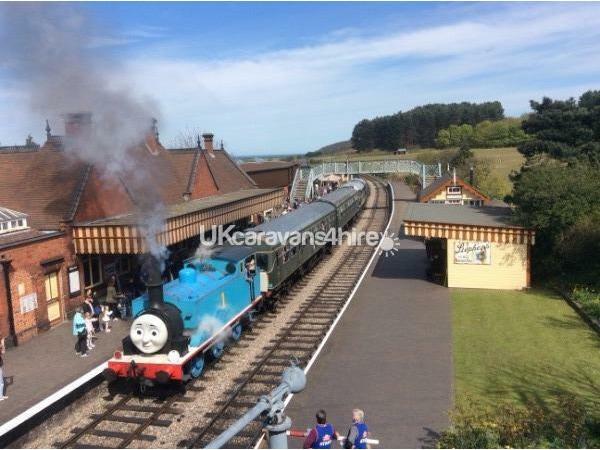 Shorter breaks also available - please contact us re price and availability. 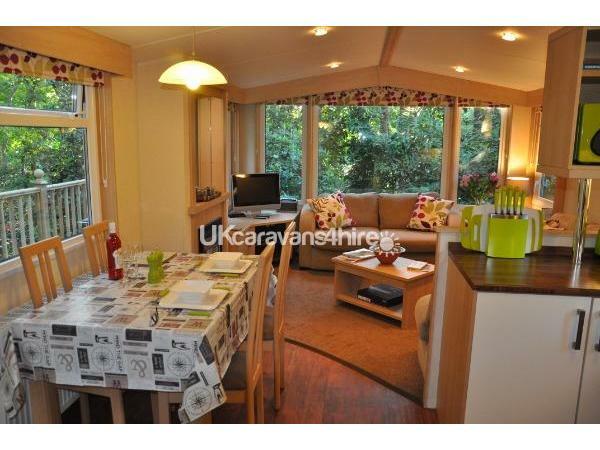 Squirrels Hollow is a modern, centrally heated, privately owned 35 x 12ft holiday home set in a secluded part of the Park. 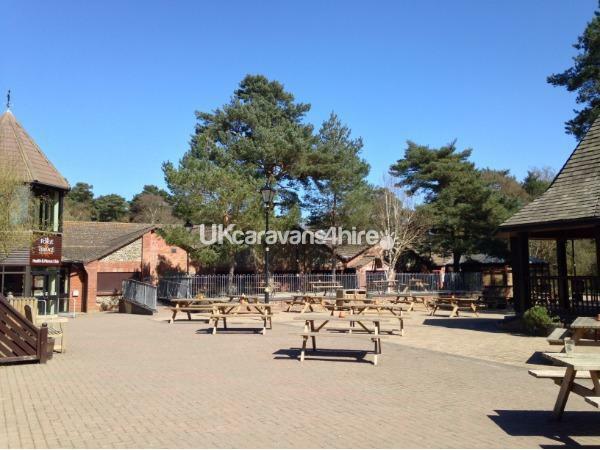 The fully fenced plot is surrounded by shrubs and woodland making it an ideal holiday location at any time of the year. 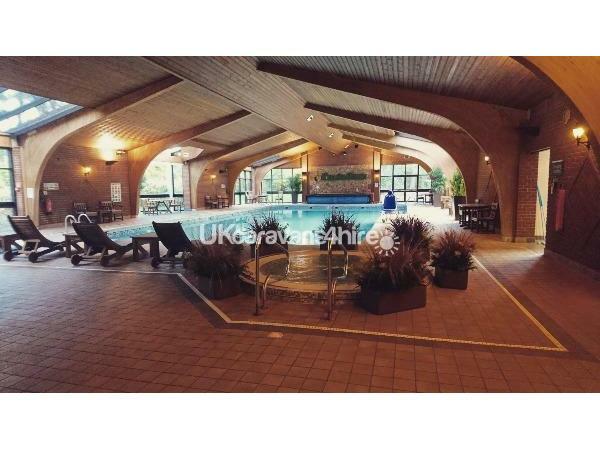 Additional Info: Sauna, Steam Room, Jacuzzi, Outdoor Pool, Outdoor Table Tennis, Boules, Trim Trails, Walking Trails, Cycling Trails, Cycle Hire, Children's Activity Adventure Areas, Pizzeria, Restaurant and Bar, Coffee Shop, Entertainment, Organised Events/Activities, Payphone, WIFI in bar and leisure areas. 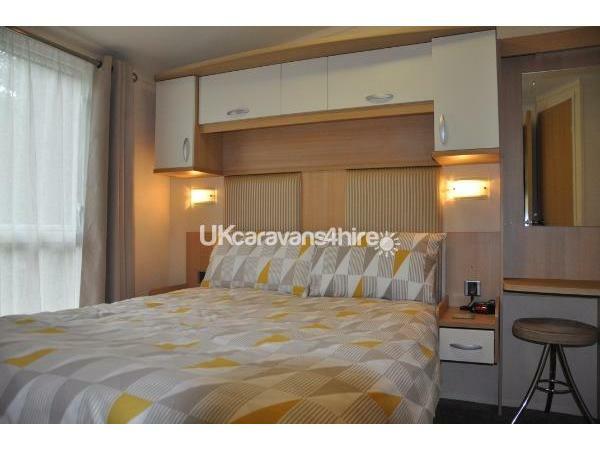 Beautiful furnished and extremely clean holiday home with absolutely everything thought of. We staying here for 1 week and loved every minute of it. This van is a real find and definately worth the money. Dylis communicated all the way through from start to finish and nothing was missed out. We had a very relaxing time in Squirrels Hollows and would definately recommend this holiday home to others. Beautiful garden and almost like home from home. thank you for making us feel so welcome. will definately come back again. 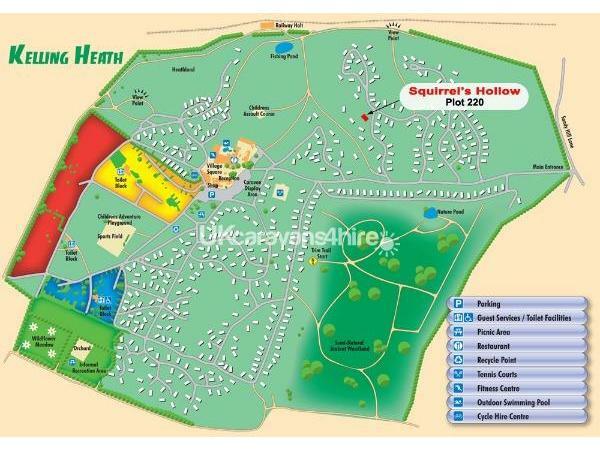 Pleased Squirrel's Hollow lived up to your expectation after coming round to booking 12 months ago on your way home from your holiday last year on Kelling Heath Holiday Park. Really good to know you enjoyed your stay. Highly recommend staying at Squirrels Hollow. Probably the best holiday accommodation for cleanliness and facilities. Everything you needed was there. Not a speck of dust or damp (as have had in statics in past) and lovely taste of decor.The plot is lovely with a fully enclosed wrap around garden, ideal for our small dog. Also not feel over looked and we went in March/April when bushes not fully in bloom, I should think if went in Spring/Summer the foliage surrounding the van will be lovely and make the garden feel even more private. We went around other areas of the site and this particular are is very well laid. Lovely site with plenty of wildlife right on your doorstep. Dylis the owner has been great with communication. Kelling Heath does have various facilities eg. shop, laundrette, restaurant etc., and prices a little steep but what you expect from site facilities. We will definitely be looking to go back one day. Pleased you found the accommodation to be well looked after and thank you for your review, very much appreciated. Thank you for such a lovely review and so pleased you enjoyed your stay.